London Aire Chimney Services LLC has been solving water leaks for over 26 years. We are the “go to” company in the metro area regarding leaking chimneys. When no one else can pinpoint and solve a water penetration problem we are the company that is called in. We routinely save our clients thousands and tens of thousands of dollars by solving water penetration issues before the moisture destroys portions of their home. The chimneys location at the top of the roof means it is constantly exposed to the elements. This weather causes masonry deterioration which is one of the leading causes of home water leaks. Water leak damage can be severe if not taken care of right away. Call the experienced technicians at London Aire Chimney Services LLC, the Water Leak Specialist of the Metro area for affordable solutions today Moisture is One of Your Fireplace’s Worst Enemies. Anyone that says otherwise is just not telling you the truth. A leaking chimney is one that is deteriorating in front of your eyes and must not be put off. If you do you may need extensive masonry work on your chimney and even on your fireplace. The twin cities metro area gets a lot of rain and snow throughout the year and those cold winters are tough on your chimney. That’s because most chimneys are constructed with brick, which is a porous material held together by mortar, which is a water soluble material. The inside of the chimney is composed of metal, which is a material that’s highly susceptible to rust. 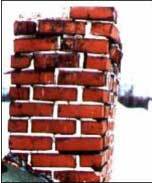 As odd as it may seem, water causes more damage to masonry chimneys than fire. All the brick and other materials that make up your home are protected by the roof and eave, all that is, except your chimney. The chimney bravely sticks up above the roof constantly exposed to all the elements; rain, snow, and freeze/thaw cycles. A masonry chimney is constructed of a variety of masonry and metal materials, including brick, mortar, tile, steel and cast iron. All of these materials will suffer accelerated deterioration as a result of prolonged contact with water. Masonry materials deteriorate quickly when exposed to the freeze/thaw process in which moisture that has penetrated the materials periodically freezes and expands, causing undue stress. Water in the chimney also causes rust in steel and cast iron, weakening or destroying the metal parts. Rotted adjacent wood and ruined wall coverings in your home. Water damage to masonry chimneys is usually a slow, subtle process. The problem is often not evident until it has become quite serious. Although these water prevention measures may cost a few dollars initially, they will save you the major expense of large masonry repairs or rebuilding of the entire chimney in the not too distant future, and as such represent a wise investment in your home. If you hear or see water dripping into the firebox or streaking down the firebox wall or from the ceiling or wall where your fireplace resides, please call us immediately. We cannot be clear enough about this as water leaks can potentially cause you thousands, if not tens of thousands of dollars in repairs to the chimney system, ceilings, mantels, walls and flooring in your home. The sooner the issue is addressed, located and stopped, the better it is for you and your family, not to mention damage to your home. If you have called out a roofer and he tells you he can’t find anything leaking on the roof, call us! Roofing companies know roofing, we know chimneys and we know what the most common issues are when it comes to leaks in and around your chimney. Please do no misunderstand, we love and work very closely with a number of roofing companies in the Twin Cities area. However, we are not expert roofers and would never try and repair something that we do not have expertise in. We have seen some try and fail to the horror of the customer. If the leak involves the chimney or you think could involve a chimney system, call us first.